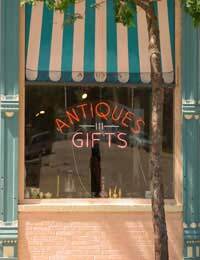 Antiques are a very specialised market, whether it's furniture, collectables, or any other branch. The one thing you can guarantee is that many items - some famous, many not - have been faked at some point, with dealers and consumers fooled. The fake antique business can be very lucrative, especially for the high-end items, which are usually done by real craftsmen and can be so good that only real experts can tell whether they're authentic or not - and sometimes not even then. At the other end of the scale are the mass-produced Chinese fakes that might superficially look good to the untrained eye, but wouldn't fool anyone with a smidgen of knowledge. In between are the good and not so good, and many of them are for sale in online auctions such as those on eBay, or at car boots sales and antiques fairs. The problems is that "antiques" covers such a wide range of possibilities - anything old or vintage, really - that being an expert in every field is impossible; becoming an expert in one takes a lifetime of study. Most people might acquire a passing knowledge at best. The first thing to understand is that if you don't know what you're doing, then sooner or later you're going to be a victim of the fake antique - and it will probably be sooner rather than later! Furniture and art are two areas where the novice is very readily fooled. Do your research, as much as you can beforehand. Read every book and magazine you can get hold of in your specialist field, take a course if possible. You need to know the styles and the features that distinguish and authenticate particular craftsman or stylists. Following a basis in theory, you will then need to see the real items. Go to museums, to auction rooms and sales, and in the latter see if you can spot the fakes - they'll certainly be there. If possible, go in the company of someone experienced, an antiques dealer or expert to show you things. The more familiar you become, the less likely you are to be fooled by a dealer or at an auction. Accept the fact that the odds of you finding a bargain worth thousands at a car boot sale are astronomical. If something is priced cheaply, the usual reason is because it's worthless. That £2 piece of scrimshaw, for instance, is going to be a fake on plastic, not real 19th century carving on a whale's tooth. That doesn't mean you shouldn't keep looking, but do it with a jaundiced eye and realise the odds are about the same as winning the lottery. If you buy an antique and you're not certain whether it's the real thing, take it to an expert. If it turns out to be fake, then you've learnt from experience. But you can also go back to the person who sold it to you. If it's a reputable dealer, he'll give you your money back without question. You'll make mistakes, everyone does. But they can be minimal. If you're looking at something expensive, don't be afraid to bring in a second, informed opinion. Use common sense and your knowledge, be careful, not impulsive, and you'll avoid most of the fakes.